Environmentally conscious staff members of Westchester County GIS in New York State have found a way to raise awareness about global warming in their community. 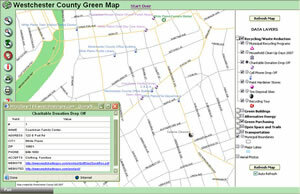 They have created an online Green Map (http://greenmap.westchestergov.com/) that allows residents to see resources that support green practices such as recycling centers, tire disposal sites, and farmers' markets. Users can query the features using the Identify tool. Links to relevant Web sites can be accessed for more information. The map service utilizes Esri's ArcIMS software along with technology from Green Map System, Inc. (GMS), an organization devoted to developing sustainable communities with mapmaking tools that increase awareness of local conservation opportunities. More than 900,000 people live in Westchester County, which borders New York City. As a densely populated county, it finds following environmentally friendly practices necessary for sustainable living. The county's interactive Green Map was launched as part of county executive Andy Spano's Global Warming Task Force, whose mission is to create a countywide action plan to reduce greenhouse emissions and promote sustainable development through awareness and education. The Green Map helps residents find environmentally friendly and green resources that are available in their own community. Viewers can select the category they want, such as bus stops, tire disposal sites, farmers' markets, or green buildings, and find the nearest and most accessible locations. Users also have the option of viewing aerial imagery on the map. Westchester County's Green Map application highlights facilities, programs, and services that encourage greener living within the county. Here, the pink triangles represent municipal recycling programs, the green circles are farmers' markets, the trees are farms and orchards, the houses represent locations for household cleanup-day events, and the orange flora represents the locations of the county's aquatic restoration sites. Designed for easy navigation, the map lets users simply select the resources they wish to see labeled, find the most convenient location, and zoom in until they can see the exact place (e.g., intersection or street name). Users can display or hide features on the map, as well as find out more about anything that interests them, by clicking a link to source Web sites. Residents frequently visit the site to find the closest farmers' markets, cell phone recycling locations, or hazardous household chemical disposal sites. If county residents would like to spend time outdoors, they can also use the Green Map to search for local parks and nature reserves. The Web site supplies community members with downloadable datasets for each of the categories represented on the map. 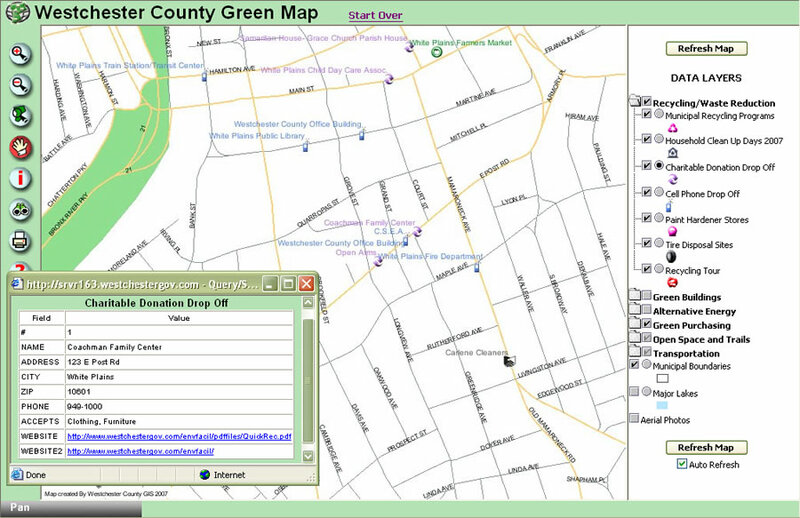 The site provides detailed information about the dates and locations for household cleanup days and other green activities, which are also displayed on the map. The ArcIMS software-based application enables users to browse, query, and print their maps. 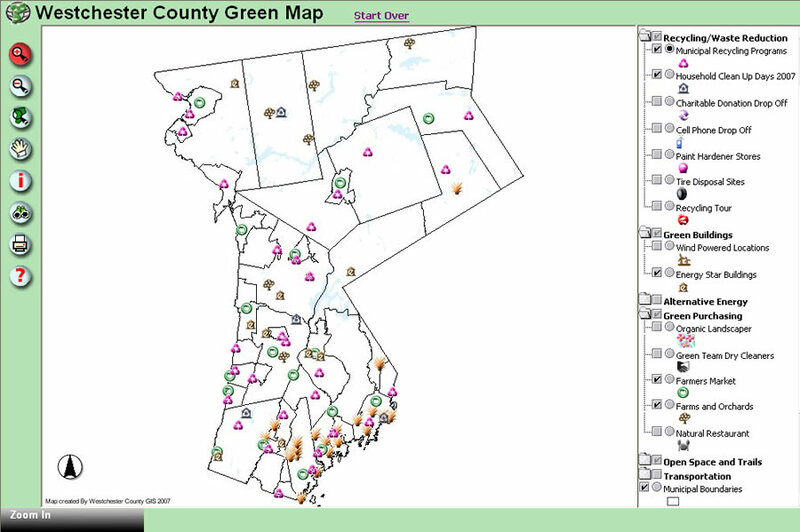 In contrast to traditional Green Map publications that usually appear in either hard-copy format and/or Adobe Acrobat PDF, the online map gives users a more accessible, intuitive, and interactive look at the county and its local resources. Additionally, Westchester County's GIS specialists can easily add or update features as needed and are able to display any amount of data without crowding the map or simplifying the data, which often occurs with printed maps. "It is a resource for anyone who wants to find out how to make their household and community more environmentally friendly places to live, work, and play," said Cynthia Louie, GIS specialist for Westchester County, adding that public involvement in conservation practices has increased since its implementation. By taking climate change issues into its own hands, Westchester County is leading the way for other local and regional governments that want to find a way to develop more sustainable practices. For more information, contact Cynthia Louie at llc4@westchestergov.com.